This window evaporative cooler uses plain old water to cool air, not a refrigerant. It performs best in hot, dry climates. Courtesy of The Phoenix Manufacturing Company. Evaporative cooling is a reliable, "low-tech" method to provide cooler air during hot weather. Installing an evaporative cooling system is an alternative method to using an air conditioning system that pumps refrigerant through compression and evaporative cycles. It's easy to understand how evaporative cooling works because the human body has its own built-in evaporative cooling system in the form of perspiration. We sweat when we're hot, and we cool off as the sweat evaporates from skin or clothes. It takes heat energy to change water from a liquid into a vapor, so heat is lost (causing cooling) when this phase change occurs. To use an evaporative cooling system in your home, contact your local Dr. Energy Saver! We'll tell you if this solution will provide effective cooling for your home. 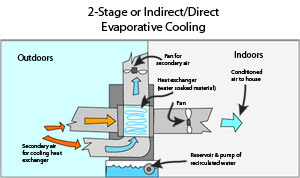 Although there are several types of evaporative coolers, including indirect, direct, and 2-stage, direct evaporative coolers are the most common. Warm exterior air is blown through a dampened pad or heat exchanger, and the airstream cools as the moisture evaporates into it. Evaporative cooling has a longer history than refrigerant-based cooling. In fact, you'll sometimes hear this type of air conditioning system referred to as a "swamp cooler" because early systems often produced a pungent "swampy" smell. Today's evaporative cooling systems use up to 60% less electricity than comparably sized refrigerant-based AC systems. They are available in portable, window, and whole-house configurations. Portable units are typically designed for cooling a single room, although large-capacity portable units are available. Window units come in several sizes and typically require more space than an window air conditioner. Whole-house evaporative coolers typically mount on the roof and deliver cool air to the house through ductwork. Interested in evaporative cooling, or ready for an expert opinion about the best cooling system for your home? Dr. Energy Saver specializes in air conditioning systems that are energy-efficient and sure to see you through the hot summer months. Contact your local dealer today and get started on your home cooling needs!